Ireland fly-half Jonathan Sexton and second row Mike McCarthy have been ruled out of the Six Nations game against Scotland on 24 February. Sexton sustained a hamstring injury in the defeat by England with McCarthy picking up knee ligament damage. Simon Zebo has already been ruled out for 10 weeks because of a broken foot. Ulster trio Paddy Jackson, Tom Court and Iain Henderson have been added to the Ireland squad along with Leinster's Fergus McFadden and Devin Toner. Jackson's inclusion means he is line to be on the bench at Murrayfield with Ronan O'Gara replacing injured Sexton at number 10. Court will hope that he is in contention to replace suspended Cian Healy against the Scots although the likelihood is that the Ulster man will have to be content with a bench berth with Munster's Dave Kilcoyne probably starting. McFadden's addition to the squad appears to mean further disappointment for Andrew Trimble although Declan Kidney named the Ulsterman among players that the Ireland management will be monitoring in this weekend's Pro12 matches. While Sexton and McCarthy will miss the Murrayfield contest, Brian O'Driscoll, Rob Kearney, Sean O'Brien and Donnacha Ryan are set to be fit for the 24 February game. Team manager Mick Kearney said that Sexton's scan had revealed a "grade two hamstring injury". "Progress has been good so far, but it's too early to say when he will return to play," Kearney said on Thursday. "Mike (McCarthy) has hurt the medial ligament of his right knee. It's quite sore and he will be in a brace for two weeks." The Irish manager had better news about Ireland's other injury concerns. "Brian (O'Driscoll) had a recurrence of the soft tissue injury in his good ankle. Scans revealed no structural damage and he will do non-contact training today," said Kearney. 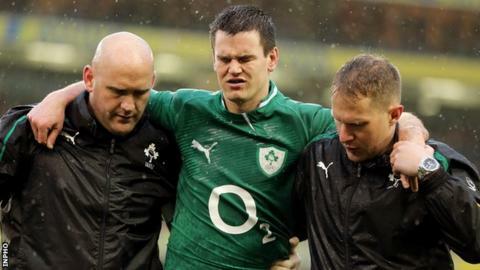 "Donnacha Ryan suffered a lower back muscle strain. Scans have excluded structural damage but he's quite sore and won't train this week. "He'll be reassessed at the weekend and at this stage he has a good chance of being available against Scotland. "Sean O'Brien has recovered well from his stiff neck and tight hamstring and will train today. "Rob (Kearney) is fine. He had a slight dead leg but trained fully today." The Ireland management are mulling over whether to appeal against Cian Healy's three-week ban for stamping on England's Dan Cole in last weekend's game.